How did you first get into yoga? 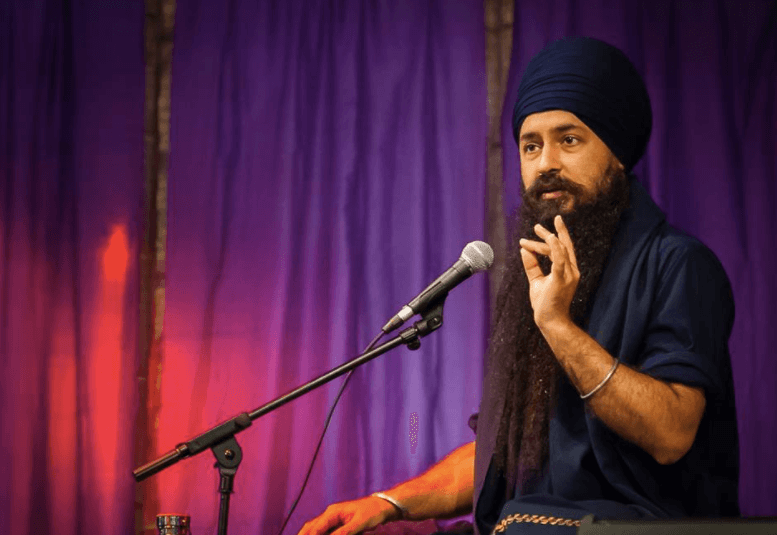 Amandeep Singh: The first sound I heard was Mul Mantra when I was born. The Mul Mantra was recited to my ears by my grandmother. The hospital at which I was born was within walking distance from the Golden Temple. In that way, Naad Yoga (the yoga of sound) started from birth. As I grew up, I had the privilege and blessings to meet many Great Dharma Masters, sages, and teachers who had renounced the world and were walking a path of Dharma. Also, I studied with lineage holders who transmit the wisdom of Dharma, through heart to heart transmission. In Gurmukhi, this transmission is called “Sina ba sina”. Having grown up in this environment, I also wanted to renounce the world and dedicate my life to Dharma. Having received the teachings from these Masters, I used to meditate for days in my private meditation cell which I built in my own home. Influenced by the teachings from the Udasi lineage holders and also by the Nimala Sikh lineage Masters, the desire for awakening ignited within me when I was 14 years old. So, I ran away from home for the first time to be in the Himalayas and meditate in the caves. But destiny had something else in mind for me. I was caught by my family and brought back to them. Though I made two more attempts to run away, the Guru had something else in mind. At age 18, I found a book in the Gurdwara called The Teachings of Yogi Bhajan. Today when I think about it, that book was specially placed in that Gurdwara just for me. That book opened my door to paradise. The teachings of Yogi Bhajan were introduced into my seeking heart. Immediately I realized this is what I have been searching for. The longing to go to the Himalayas was actually the longing to meet my Master. The Master is the living embodiment of the Himalayan wisdom. I realized, the wisdom is not in the caves. The wisdom is in the heart of the one who, at a specific time and space, transmits it to humanity. Living Masters are known as living “Tiraths” – ever activated vortex beings, who in their own self do not exist. And because they don’t exist, the universe exists thru them. After reading that book, I wrote my first letter to my beloved Master Yogi Bhajan to accept me as his student. And to my amazement, a month later, I received a letter from Yogi Bhajan accepting me and predicting my life and the work I’m doing now – traveling the world and sharing Dharma. What inspired you to become a teacher and what keeps your passion for teaching going? Amandeep Singh: For me specifically and from my perspective, a teacher is always a student. Because what can a mentor teach and what can a mentor give to another mentor? A real teacher is always a student. In his humbleness, a student receives the teachings and it is the Guru who teaches through you. In the words of Yogi Bhajan, when we tune in, it’s not us. 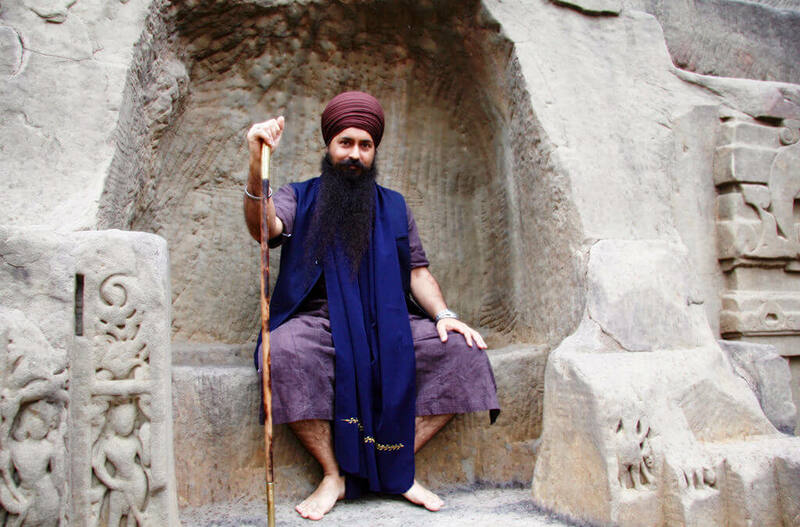 The primal Adi Shakti flows through you with the grace of Guru Ram Das, and that grace is the teacher. The real meaning of a teacher is to sit as a student, even on the teacher’s bench. So, I have long aspired to be a student, and I’m still a student, and I shall be a student; because, a student receives, and when he receives then he can share. As a teacher, one can only give. If one gives and gives, you become empty. As a student you are always full because you know someone higher is always in charge. For me to be a teacher is always to be a true, devoted student. I keep going with an intention to connect people to Dharma, to offer people the experience of their true nature, and to share the wisdom that we don’t exist but the universe is existing through us. The greatest wisdom as mentioned in the “Upnishad” is that you are neither this, nor are you that. The less you are, the more you are connected. In today’s modern world, we are running for achievement; we are running for something more. And this creates anxiety. You are here, but you want to be there; or, you are there, but you want to be here. I long to share that when you are here, be here; and when you are there, be there. I long to share the simplicity of Dharma. Amandeep Singh: ‘Sat’ means truth; Nam means identity. It’s a festival to find true identity in the company of Sangat. This is an opportunity for individual seekers to come and sit with other seekers, so that we can create a collective consciousness to help each other to grow and to glow. Sat Nam Fest gives me an opportunity to walk with these beautiful seekers, innocent seekers, who have started their journey for many life times, whom I have been sitting with in previous life times. Sat Nam Fest gives me an opportunity to sit with them again. Sat Nam Fest is an opportunity to see each other eye to eye, and to hear each other ear to ear, and to feel each other heart to heart. Amandeep Singh: My favorite aspect of Sat Nam Fest is when I see hundreds of people sitting together and chanting mantras. This deep unity we create by chanting together is what the Sufis called Wahdut-ul-wajood In this unity of being, even if one seeker transcends the mind — a wave is created, or a frequency is created — that affects the entire group. Seeing people walking together, seeing people sharing their ecstasy, their joy together, eating together, and sitting with people whom you may not know, who just started communication with you, and a single word you shared can transcend their whole life. Amandeep Singh: is written in the Sufi text in which someone asked a question: What can be a hobby of the one who is seeking? The answer: walking. The questioner again asked: To where should I be walking? The answer came: To wherever you want to walk. Along with walking, my hobbies are eating Thai food and drinking coconut water. body, I have no mind. I have no spirit, I am just the breath of life. The breath of God, the breath of Divine.” When I connect with my breath, I connect with my reality, which is beyond mind, body and spirit. The realm of the breath is known as the 4 th realm, which is known as Turiya in the yogic teachings. Turiya is the state when one is not affected by what is happening in the 1st , 2nd and 3rd realms of the body, mind and spirit. Do you have a favorite mantra? Amandeep Singh: Japji, which contains the sound of my Ji. Ji is the soul. Jap Ji is close to me because my sound is within Japji. When Japji was born, Dharma was born. Japji sustains me in the Dharma, even now. In order to sustain Dharma, one has to recite Japji. It is written in ancient Sikh writings, one who knows Japji, knows everything. One who doesn’t know Japji, knows nothing. Japji contains every possible sound that can be created, the 108 elements dancing in harmony. What can be more dear and more favorite than the Jap – meditation, and Ji – soul, the meditation of my soul.